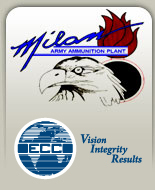 A Technical Review Committee (TRC) was formed in February 1988 to review and comment on proposed Army response actions with respect to Milan Army Ammunition Plant’s (MLAAP) restoration of past hazardous waste sites. The general public had significant interest in the response actions being planned at MLAAP due to the contamination of the City of Milan’s drinking water wells. Meetings were held regularly until the TRC was converted to a Restoration Advisory Board (RAB). The TRC was converted to a RAB in in 1994. The purpose of the RAB was to promote community involvement by giving the public opportunity to regularly review progress and participate in dialogue with the decision makers on the MLAAP restoration process. The first meeting of the RAB was held on July 12, 1994. The Army has currently either initiated or completed all remedial actions. Following the signing of the Final Site-wide Groundwater Remedial Action Record of Decision (ROD) on July 31, 2014, the RAB voted and approved adjournment of the RAB at their final meeting on August 5, 2014. The installation has agreed to implement an annual public meeting concerning ongoing remedial operations and monitoring for former RAB members and the general public.